My last Apple product. How many years I played with this baby. The hours and hours and hours... and hours. Days. Weeks. YEARS. I can't quite recall when I first got the Apple II. I was probably 8 or 9 at the time. Of course, back then it was all about the games. But one day I got bored, and decided I wanted to write my own games. But I didn't know how. But I learned. Did I take a college course? Of course not. I simply started reading programs. Learned basic that way. Played a lot of games tho. 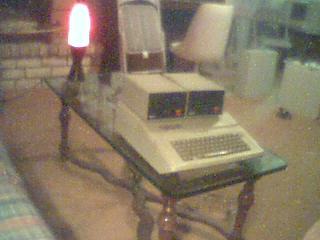 Played Ultima I on that beast. Yes, the ORIGINAL Ultima. Those were the days. Oh yes, those were the days. Crazy Mazy, Montezuma's Revenge, Oregon Trail, Mystery House, Ultima I, Zork, The Eamon games, Castle Wolfenstein. And countless text adventure games. I always liked those more for some reason. When I was a Freshman in high school, I did my first computer interface for my science project, using this very apple II. Controlled 8 LED's and read input from 8 switches. Kind of a precursor to what I'm doing now perhaps. Kept it through that summer. But then I bought my first XT. And the Apple II, the proud warrior that it was, got reassigned to attic duty, never to perform again. But for some reason, I just don't have the heart to ever give it away.